Update: 07/14/2016: This offering is at capacity, and registration has closed. We are currently working to schedule another offering. Only those who have pre-registered will be admitted to the July 18 offering. 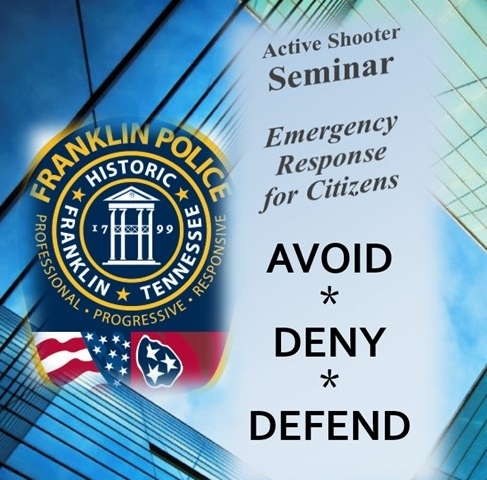 Due to the overwhelming response to our first offering, this morning, the Franklin Police Department has scheduled a second opportunity for community members to attend this free 1.5 hour seminar, designed to help keep citizens safe during the unthinkable. On July 18, Franklin Police Officers will share with citizens, employers, and community leaders, way to improve their response to an unforeseen, mass violence encounter. During the one and a half hour seminar, officers will discuss three main, national best practices: Avoid, Deny, Defend. The seminar is free, and open to the public – but pre-registration is required.